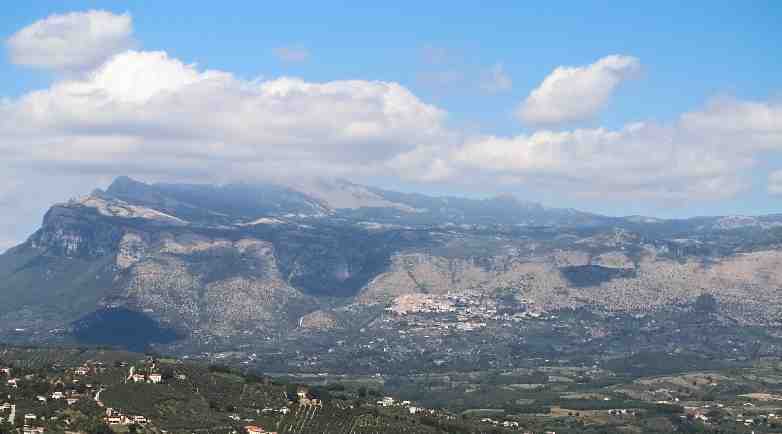 The Costa Palomba is the south-western flank of the "Alburni Mounts" (here, seen from across the Calore valley). The town on the slope in the center is Castelcivita at 526 meters (c. 1700 feet). The plateau slopes upward to the northwest from about 1100 m. with peaks above 1700 m. (c. 5500 feet). The high flank, dropping off on the left, is directly above the Paestum plain. The term costa in Italian generally means the same thing as "coast" in English—a stretch of land bordering on the sea. It can, however, also mean "mountain side," or "flank of a mountain." Thus, in the Cilento Hills just a few miles inland from Paestum, the remarkable geological feature uplifted between the Calore river (in the valley in the center of the above photo) and the Sele river (on the other side, not visible in this photo) is called i monti Alburni, the Alburni Mounts, named for the principal height on the plateau, Mount Alburno, visible in the photo (the peak sticking up to the right of center). Costa Palomba is the local name for the south-western flank visible in the photo. (Palomba is dialect for the Italian colomba, dove. Note the similarity to the Spanish, paloma.) Indeed, there is something aerodynamic about the entire massif, as it if it were about to go airborne, to take off. The plateau extends for some distance beyond the photo to the right. The entire tableland was for many centuries one of the target grazing lands, the end of the road, on the long seasonal migration of shepherds and livestock from the plains in the interior. In Italian, this type of seasonal movement is called transumanza (from Latin for "across the ground"). The area was apparently first used by an early Italic tribe called the Enotrians many centuries before the Greeks arrived to settle the nearby coast at Poseidonia (Paestum) in 600 BC, and then around 700-600 BC by the "transhumant pastoralists" who displaced the Enotrians, the Lucanians. 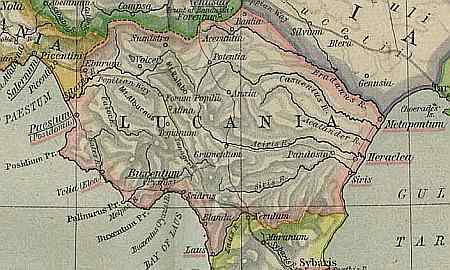 The Lucanians were cousins of the Samnites, who were centered somewhat to the north near Benevento and who became later known as implacable enemies of the Romans. Most of these early Italic tribes had spread from north to south through Italy many centuries earlier as part of the Indo-European expansion. The myths of their expansion involve the so-called "rites of Spring" during which excess population was expelled from the parent group through a ritual of vicarious animal sacrifice; those sent off to seek their own valleys, hills and fortunes would, in turn, later stage their own "rites of Spring" and send off others. Thus, the peninsula filled up with Samnites, Lucanians, Enotrians, Sabines and, of course, Latins — the Romans, who made us forget all the others. Anthropologists and archaeologists generally divide pastoralism into various kinds. You can have true migratory tribes who tend animals as a way of life and lead a nomadic life-style. In the case of southern Italy, however, pastoralism was of a different kind. These were not simple herders of goats and sheep, constantly on the move and eking out a subsistence-level life. The pastoralists in southern Italy were often from a solid, substantial culture for whom the ownership and migrating of livestock during the transumanza were cultural constructs, part of a much more complex life. The Samnites, for example, also great pastoralists with their own transumanza routes farther north, were a powerful and warlike culture. Moving animals back and forth along migration routes did more than just feed the animals; it gave the owners the opportunity to make themselves physically known in adjacent territory; it gave them the prestige of showing off their wealth of livestock; it let them form unions, make allies and engage in trade using the secondary products of the animals, such as wool and milk; and seasonal migration renewed contact among cousin peoples separated by the centuries—such as the Samnites and Lucanians. The ancient transumanza moved from the plains of eastern Lucania, crossed the main body of the Apennines into the western hills of the Cilento to enter upon the Alburni plateau at a point about 1100 meters above sea level near the modern town of Sant'Angelo a Fasanella (out of sight on the right in the photo at the top of this entry). 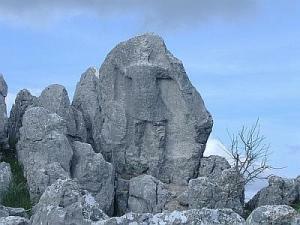 There are still traces of a wall around the rocky perimeter of the summit, and near the entrance, there is still a somewhat mysterious rock carving, (photo, below) put in place either by early pastoralists or by later Samnites who moved into the area around 400 BC. Also, numerous ceramic fragments have been found strewn over the plateau; they bear cord decorations, and well as finger impressions and geometric designs that recall the final period of the Bronze Age. The ceramics apparently do not bear any alphabetic inscriptions, which puts them well before the year 700 BC (at which time the first pottery with Greek inscriptions appears at Pithecusa (Ischia). (Whatever inscriptions have been found in Oscan, the language of the Samnites and Lucanians, are from later centuries and are in Greek letters.) Also, at the base of the slopes, there are remains of circular huts set at ground level; they are relatively well preserved and typical of ancient shepherd communities. down to the wild Adriatic,/as green as the mountain meadows. Modern times have rendered the ancient seasonal migration of livestock obsolete, but the area is still full of local livestock and shepherds. The shepherds still tend their animals the way they have always done.